Sale and Sale Moor provide a vast selection of goods and services for local residents. 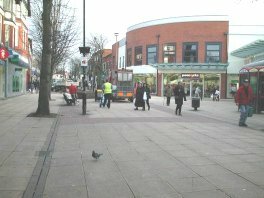 We are served by several supermarkets and over 200 specialist shops within easy walking distance in the pedestrianised town centre. From the searches that people regularly make on Sale Community Web, it is clear that residents want to find local businesses and tradespeople. They prefer to use local businesses and support the community. The aim of this website is to promote and publicise Sale and Sale Moor. Sale Web has always concentrated on promoting the voluntary and social sectors but business is also an important part of this community. Disclaimer: Note that the inclusion of any company, group, therapist or service on Sale Web does not constitute a recommendation. It is always advisable to check references and qualifications before hiring or using any service provider.